Tourists travelling to Alexandria have chosen a culturally rich, divers e destination with a history that dates back more than 2,000 years. Historical monuments such as the Citadel of Qaitbay, a stronghold by the Mediterranean where a fortress and a lighthouse once stood and the cemetery of Mostafa Kamel with its four ancient tombs are just two of the popular sites to see. Add to that Kom el-Shouqafa, Popey's Pillar, the Roman Theater and you have experienced just a little bit of this city. Museums like the Royal Jewelry Museum, the Museum of Fine Arts , the Alexandria National Museum and the Graeco-Roman Museum are just a few of the museums that teach generation after generation the secrets of Egypts past. fort of Qaitbey :Fort Qaitbey is an impressive building, located on a narrow peninsula where one of the ancient wonders of the world, the famous lighthouse -- the Pharos once stood. The Fort was built in the 15th century and now houses a naval museum. You'll need about an hour to explore the rooms and towers, as well as the museum which houses some interesting weapons. 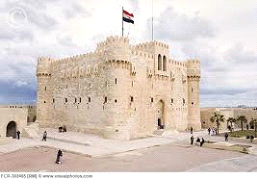 The Fort also offers beautiful views of the city of Alexandria as well as the Mediterranean. Roman amphitheatre Kom el-Dikka (literally -- Mound of Rubble) is a Roman amphitheater that isn't huge, but very well preserved nevertheless. Excavation continues nearby to reveal the remains of a Roman city. The amphitheater is a nice place to visit and relax. It's open from 9am - 4pm and is situated on the Raml Station Square. Pompey's Pillar The massive 30m column that looms over the debris of the glorious ancient settlement of Rhakotis, the original township from which Alexandria grew, is known as Pompey’s Pillar. 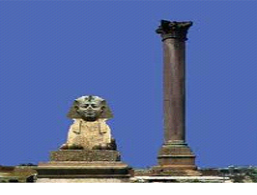 For centuries the column, hewn from red Aswan granite, has been one of the city’s prime sights, a single, tapered shaft, 2.7m at its base and capped by a fine Corinthian capital. The column was named by travellers who remembered the murder of the Roman general Pompey by Cleopatra’s brother, but an inscription on the base (presumably once covered with rubble) announces that it was erected in AD 291 to support a statue of the emperor Diocletian. Housed in the old Bassili Pasha Palace on Fouad Street, this new museum boasts historic artefacts from several different periods of Egyptian history. From the Phoraonic period to the Graeco and Roman periods, museum-goers can explore treasures that have been excavated or found during the archaeological underwater excavations in Alexandria. 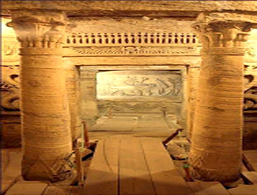 The later eras of Coptic and Islamic Egypt are also covered upstairs. The only archaeological museum in the world to be housed in a library, the museum covers discoveries from ancient Egypt, as well as those from Greek and Roman settlements in Egypt. With over 1,000 artefacts on display, a trip to the Antiquities Museum complements a visit to the New Library of Alexandria perfectly. 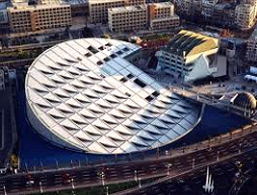 House in the New Library of Alexandria, the Planetarium Science Centre focuses on physics and astronomy. Hands-on exhibits ensure children can access all that is to be found in the centre's three sections - The Planetarium, ALEXploratorium, and History of Science Museum. Learn more about cosmic mysteries, interact with science and trace the discoveries of the world's greatest scientific scholars. Covering the Greek and Roman periods in Egyptian history, this small museum has an interesting collection of exhibits including statues, coins and other artefacts from nearby sites. Among the highlights at Alexandria's Graeco Roman Museum are a black granite statue of an Apis Bull and the god Serapis and mummies, including a mummified crocodile. There is also a small café in the courtyard offering refreshments. kom el shokafa catacombs a marvel of technology and art. Built in the late 1st century AD, the Kom el-Shuqafa (literally means "Mound of Shards") is the largest known Roman burial site in Egypt. Since the catacombs were built to house more than 300 dead notables, there are plenty of tombs to explore as well as a banqueting hall. Many of the rooms display a unique fusion of ancient Egyptian, Greek and Roman decorative artwork. Bridge Of Stanley Looks extravagant. 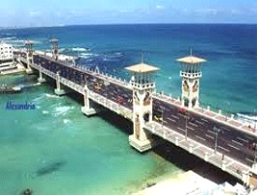 If you pass by the Corniche in Alexandria, you will not miss the Stanley bridge which is at the westbound lanes of Corniche Road. On the other side of the bridge harbours the beautiful Mediterranean Sea. The artistic craftmanship in the Corniche near the bridge is an excellent tourist attraction. You will see a couple of murals (or shall I call it carvings on the walls?) which are really awesome. The bridge is so wide that helped disperse traffic and has added to Egypt's fine and beautiful features. Alexandria Library Alexandria has historically been a place of learning. It's a city that has attracted poets and writers for thousands of years. 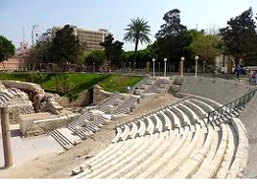 In 2002 a new library was constructed harking back to the great library of the 3rd Century BC. Unfortunately it doesn't quite have the same amount of books as it did back then, but there's plenty of room to add to the collection. Montazah Gardens and Palaces With such sunny weather and an extremely low rainfall, it is hardly a surprise that Alexandria is not full of lush botanical gardens and parklands. However, the stunning gardens around Montazah Palace are particularly impressive and are perched on the top of a fairly rocky bluff, boasting superb sea views. 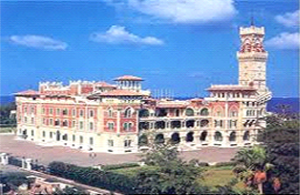 The palace was originally built as a summer refuge by the last king of Egypt, Farouk, and stands along Alexandria's coastline, being used as a place where the king could escape from the hot sun in Cairo. Montazah Palace offers Moorish-style architecture, a nearby sandy cove and there is even a Victorian bridge, which connects a neighbouring island. Palms, pine trees and exotic flowers are all here and the gardens are especially colourful during the summer, when many of the flowering plants are in full bloom.